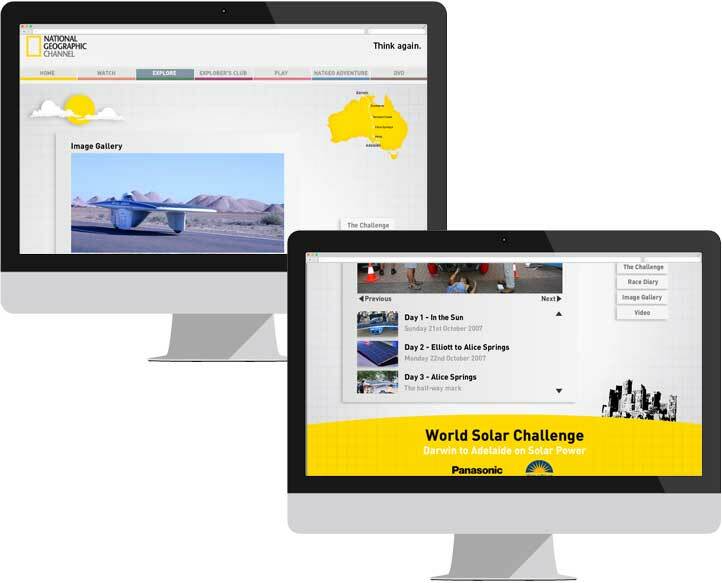 The National Geographic Channel teamed up with Panasonic World Solar Challenge to promote the 20th anniversary of the great race. Thirty-eight teams from twenty-three countries were pitched against one another in a 3000km rally across Australia’s desert interior powered on nothing but the sun! Throughout the race I filmed a series of 3x short films and documented race highlights for the NGC microsite with daily results and behind the scene extras. The multimedia approach reflected the programming strategy to expand the use of on-air and online to promote the race, to showcase the spirit of friendly competition, and to drive home the environmental importance of sustainable automotive technology. This was a successful sponsorship segment for NGC Australia leading to a stronger brand identity and audience migration across TV, Online, and Offline platforms. With only five days in the field shooting on-the-run we knew going into this story that the intimacy with the subject, the teams, and breadth of coverage would be our greatest hurdle. However with a tight film crew and access to a helicopter, we were able to divide and conquer in the field, allowing us to effectively double our efforts in covering the race from the ground and from above to bring out the very best of this exciting race.